We do not have a storefront, and we cannot accept visitors. These addresses are for shipping purposes only. Warehouse 23 is open Monday through Thursday from 9 a.m. to 4 p.m., and we are closed on Friday. If you place an order outside of business hours, we will attend to your request on the next business day. 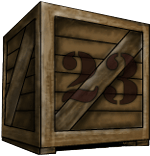 The Steve Jackson Games forums include a Warehouse 23 Area, where customers can come to discuss services and options, make suggestions, or otherwise give non-critical information to the Warehouse 23 staff and customers. The Warehouse 23 forum is not an appropriate place to post any message regarding a specific order or a message that requires a direct answer from Warehouse 23 staff. The Daily Illuminator is a daily blog by Steve Jackson Games, posting product information, company milestones, and interesting links. Periodically Warehouse 23 information is found among the other company news.